We would like to introduce the new revision "mark II" in this place a year after the presentation of the aquaduct series. 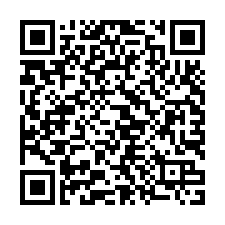 Within the last year we got much feedback and wishes and have tried to integrate these as far as possible. Some things were already changed within the last months, others will go with "mark II" in production now. Hardly visible almost every component of the aquaduct was improved or revised. 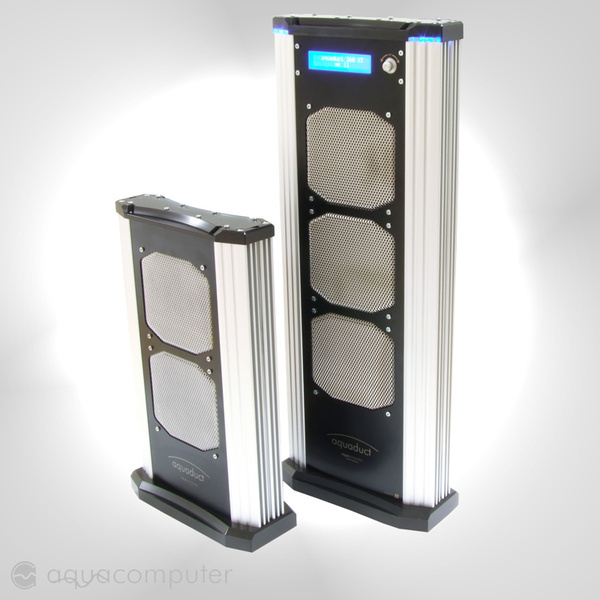 The changes of the aquaduct 240 are particularly interesting. This got a USB interface as well as an integrated fan control and the possibility of attaching a flow sensor. The compact design was kept. Connectivity for two additional temperature sensors on the enclosed PC circuit board. The measurements of these sensors can be used variously in the control unit. Knob with "one touch control". All attitudes of the control unit can be carried out userfriendly over the knob. 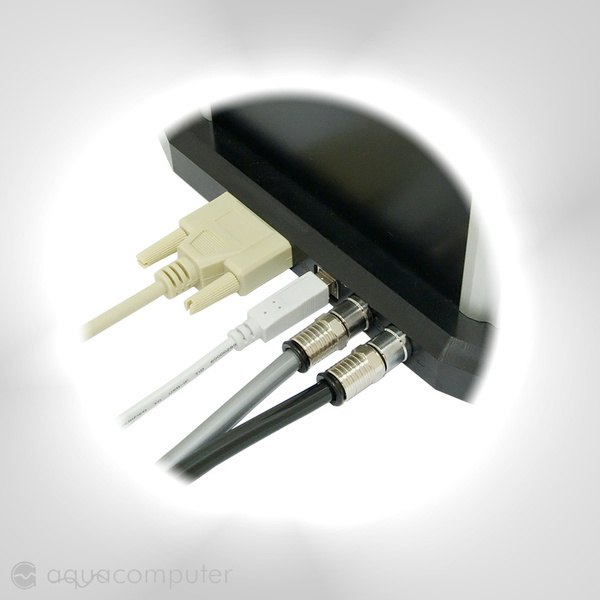 Override function: By plug&coolg and turning the knob simultaneously the aquaduct can be adjusted between a powerful "performance" mode and an almost "silent" mode. Acoustic alarm signalling system. A built-in loudspeaker distributes an acoustic signal with alarm and generates a key click at changes of the settings. Connectivity for an additional fan on the enclosed PC circuit board. 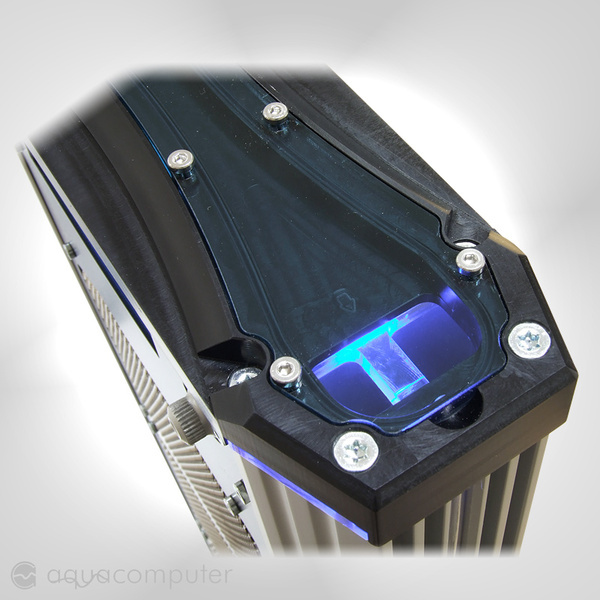 For example a case fan can be controlled via the aquaduct with that. Configurable speed signal output. At connection to a fan header of the Mainboard an emergency shutdown of the PC can be carried out via the BIOS. The available relay output can in addition be used for various alarm functions. 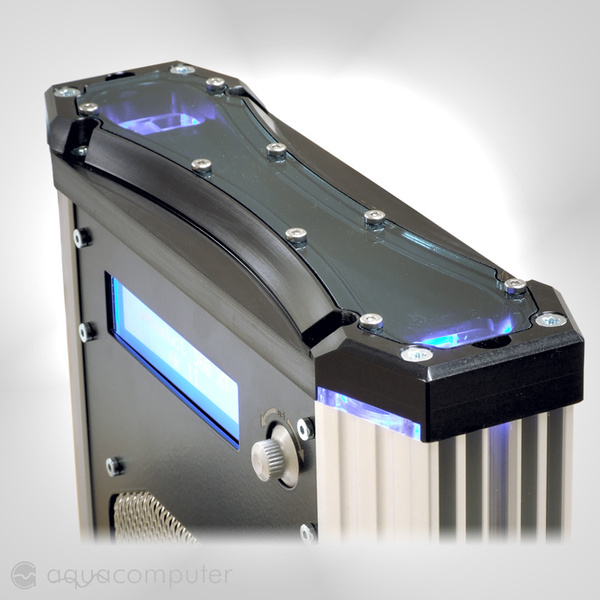 Pump drive optimized: Automatic "overclocking" and rotation detection were integrated. The maximum frequency was increased and the smooth running of the pump was improved through an adapted programming. A changed channel flow in the bottom of the new aquaduct allows an much easier deaeration of the integrated pump. Graphic representation of the device with the essential control parameters in the enclosed Windows software "aquasuite". Further details are the 15-pole connector cable and the counter-sunk plug at the bottom. Of course the circuit board in the PC was also revised completely. Two integrated temperature sensors measure both water temperature and the air temperature. The micro processor-controlled fan control offers many regulation options. An optional flow sensor can be attached on the enclosed PC circuit board. The measurements can be displayed and evaluated of course in the Windows software. Configurable speed signal output. At connection to a fan header of the Mainboard an emergency shutdown of the PC can be carried out via the BIOS. Automatic "overclocking" of the pump can be activated in the software. An analogous fan control unit for the direct control of the fans is contained in the scope of delivery. Aquaducts ordered in advance are delivered without surcharge in the version mark II. 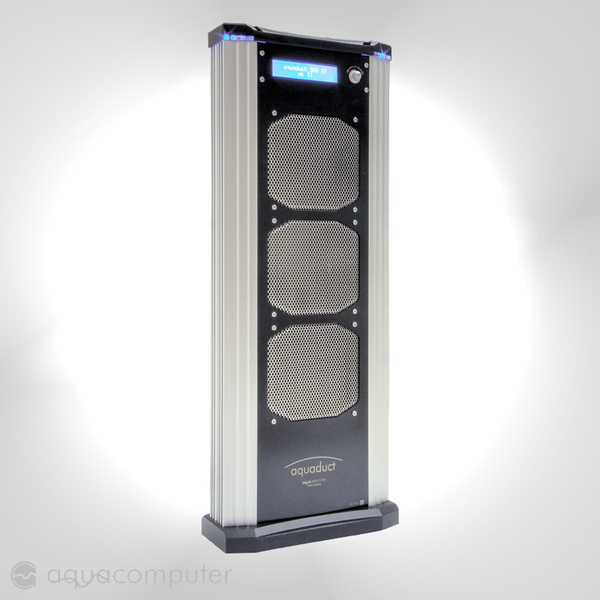 The aquaduct 360 XT mark II will be available within approx. 3 weeks, the other types are available as of now. 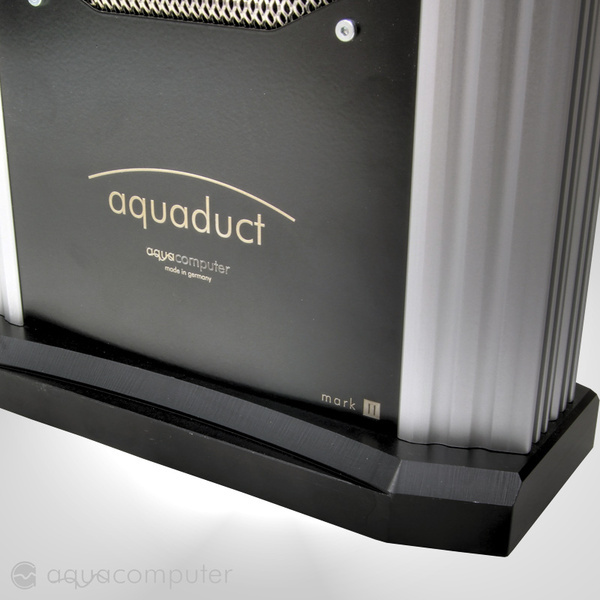 The aquaduct 360 XT mark II should not be opened by the customer. 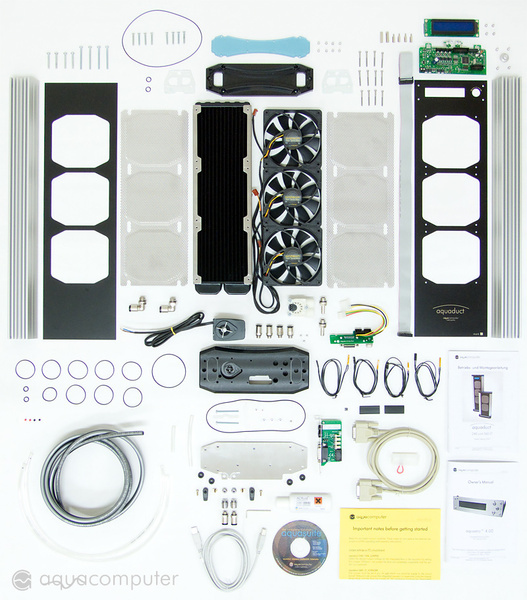 Since we would like to show from what it is built, we have taken a photograph of the more than 180 components. One should better not disassemble his own aquaduct. More than 30 o-rings must work properly so that an aquaduct 360 comes through the final highly sensitive leak tightness test. Moreover, we show you a photo of the internal construction of the aquaduct mk II series here.